Our Local Fly-tyer/ designer/ mate Bevan Clinch shares his thoughts and discussions around the topic of 'Intruders flies' and commonly asked Questions he gets about fishing these flies. Q 1) Whats the go with 'Intruder' flies anyway. What are they? A: Firstly lets get this out of the way.. An Intruder is a style of fly rather than a particular pattern. Created in the late 90's out of purpose rather than chance. 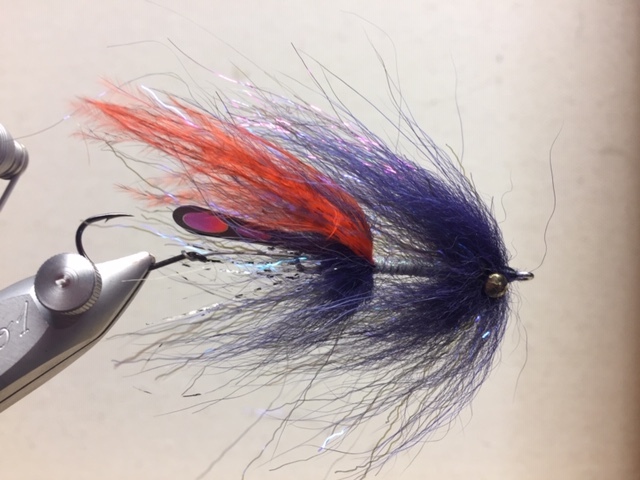 A few Die-hard Steel-head and Salmon Fly fisherman in the Pacific Northwest of USA and Canada were having great success swinging large bright flies. Back then large flies meant large heavy hooks, waterlogged materials, damaging fish, losing fish, and sore shoulders from throwing them. Not an Ideal way to fish catch and release. 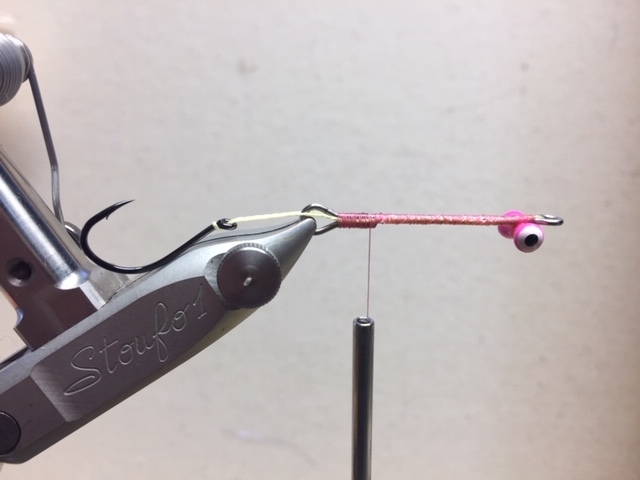 With the idea of a smaller 'Stinger' hook set behind a Steel shank, the fly enabled a large profile to be fished with better hook set and harm reduction. The fish couldn't then use the size and weight of the hook (like a hinge) to rid the hook from their jaw. Generally Intruders are tied with Two "stations"- areas where materials are tied in. Lead-eyes are sometimes added not to sink the fly, but more to neutralise often buoyant materials used. Often bright flashy materials are used. The name Intruder, means just that. It’s in the fishes face, intruding their space, putting them in a position of fight or flight. These flies were made to offend fish. Sometimes representing Squid and Prawns (favourite diet of Sea-run Steelhead and Salmon). Often representing nothing. They Trigger aggression. Q 2) Do "Intruder's" work here in New Zealand? A: Simple answer- YES. But- like any style of fly fishing- presentation is key. Reading water, locating fish, water clarity, fishing the right depth/ flow, etc are all too important. These days with dedicated rods and lines designed to fish this style of fly, it can greatly increase your success and angling pleasure. An Intruder is not the 'Silver Bullet' for catching more fish. It’s a numbers game, the more casts you make in the right spot, the right time, with the right fly, the more success you will have. Yes it’s true that bigger flies do catch more aggressive bigger fish, I find flies in the 3- 4 Inch range Ideal for New Zealand Rivers. Q 3) Whats the best colours for these flies? 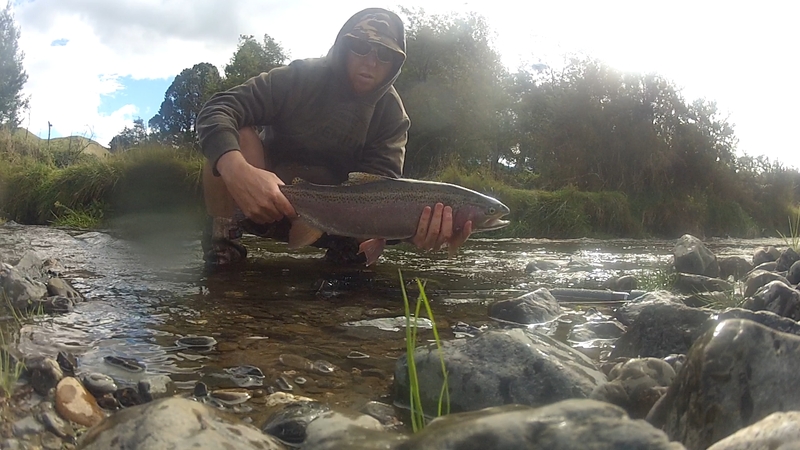 Firstly to address migratory, spawning Trout, and Steel-head (An example: Rainbow Trout from Lake Taupo running the Tongariro River). When these fish enter the rivers and streams from the lake, it’s usually to spawn. With that Trout can take on increased aggression, both territorial and feeding, readying them for spawning. To us as an angler that normally means fishing in cold, fluctuating flows, and water clarity. In coloured water I like to fish a larger size Intruder fly 3 1/2 - 5 Inches, with plenty of movement. Colours vary, but pinks, blues, yellows, oranges, have done me well. Clearer water I stick with more natural tones: olives, blacks, white, and browns in the 3- 4 Inch range. Secondly to address what I call 'the rest' of New Zealand. This is were you are fishing to resident river fish most of the year, some times more cunning, spookier, and in clearer or shallower water. 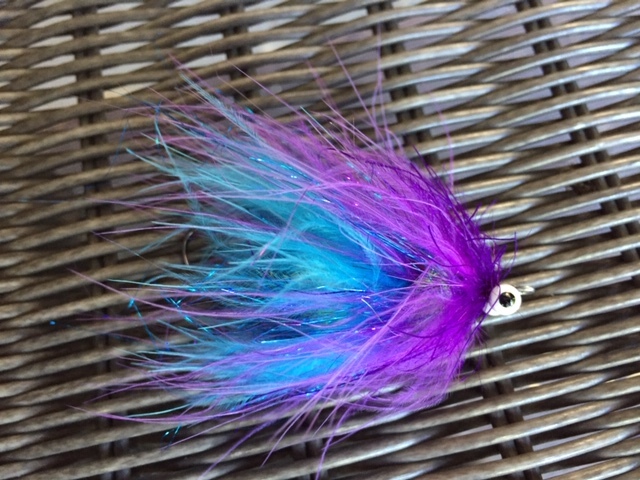 For this approach I design and fish swing flies as a more imitation fly. Think bullies, smelt, koura, baby trout, large insects, etc. Smaller flies in the 2- 3 1/2 Inch range, a bit less flash, in natural tones. Olives, browns, whites, and black, have done me well. In saying that, the biggest browns and rainbows I have taken on my home waters this past 12 months, have been on large, bright flies in crystal clear water.... so there really are no hard and fast rules. Q 4) Can I fish' Intruders' on smaller rivers and streams. A: Yes you can. Some of the streams I fish are tiny. This is were presentation and sink rate of flies are so important. Think about it.. On large rivers you fire out your line, letting line sink, swing down through a run, making numerous casts. On small water you could be fishing a run Six feet long. your fly has to get down quick to maximize exposure, as you might only get a cast or two before the fish wise up to you. I fish #5 weight rod, short leader and weighted fly (lead eyes, coneheads). Q 5) I notice Intruder Flies aren't cheap. How come? A: I can only answer for the flies I tie. My Flies firstly are tied with the very best of materials, on the highest quality hooks. They are built to be punished. They are built to catch fish, and finally they are built to last. I can spend up to 3/4 hour tying a single Intruder, but have it last for 20 or so fish before its chewed up! The amount of materials in an Intruder fly also reflects on price. Remember cheap flies are cheap for a reason. I tie all my flies personally, and they have been thoroughly tested. Bevan, resides in Napier, Hawke's Bay with his Partner and young family, He lives and breathes Family, Fishing, and Flies. Bevan will be a regular contributor to our blog so. feel free to ask any questions on tying or fishing Intruder style flies. You can check out range of Bevan's flies here.